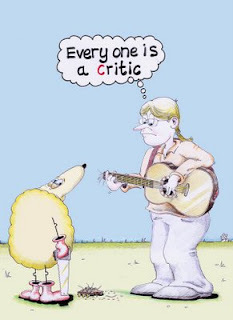 I have a difficult relationship with criticism. On one hand, I'm a master of it. I can criticize my own creative endeavours until the cows come home. Whether it's my poetry, my attempt at a novel, or even essays. It lacks subtlety. It doesn't sound intelligent enough. It's not as good as *insert name of favourite writer*. What I can't seem to do is find a way of writing eloquent critical book reviews. I've said I won't review books I don't like. And that much is true, but as far as my blog readers are concerned they probably think I adore every book I review on here and that's just not the case. Yes, I like the books I review, but that's not to say that there aren't aspects of the plot, writing style or characters that I don't like occasionally. I was speaking to a friend about this recently, I believe it's a confidence issue, and perhaps a symptom of being surrounded by so many successful writers in my day to day life. I can't help but feel inferior to them. Who am I to start criticizing their work? I've not written a novel! I will also do absolutely anything to avoid confrontation, so the idea of saying something that might spark disagreement isn't always desirable. And what if there is a secret streak of nastiness inside me? What if I get sucked into the universe of bitchy bloggers (and let's face it, there are a lot of them out there)? Having watched the 2007 comedic documentary Heckler, I'd do just about anything to avoid becoming a critical blogger for a living. Yet I know that the best writing is critical. I understand that writing critically about books is a way of ensuring people become better writers. It's a way of beginning debates and discussions that are enriching and valuable, both for me, and for the writers. So I'm making a pact with myself, and you can all be witness to this. I will make my reviews more critical. This doesn't mean I'll be lambasting anyone who appears on this blog, but I will be looking for ways to make my reviews more useful to the discerning reader.